VICS Acquisition is recalling close to 50 tons of chicken meals after it discovered misbranding issues related to undeclared allergens. An estimated 100,000 pounds of chicken has been recalled by VICS Acquisition because of undeclared allergens and misbranding issues. 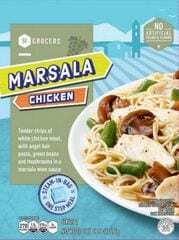 According to the recall notice, certain packages of happi foodi “Bloody Mary Inspired Chicken, Southeast Grocers Marsala Chicken and Southeast Grocers Mediterranean Herb Chicken” may contain eggs, a common food allergen. All the affected products are marked with establishment number P-34622 and were produced between August 7 and October 15, 2018. Fortunately, there have been no reports of anyone experiencing adverse reactions from consuming the products. For now, if you have one of the recalled products in your home, either throw them away or return for a refund.